When you are in need of Salinas copper repipe services, contact the qualified team at Gladiator Repipe. We want to let you know Gladiator Repipe offers excellent copper pipe replacement in Salinas. When the Gladiator team is on your side you will not have to worry about rust-colored water, low water pressure or any kind of leaks. 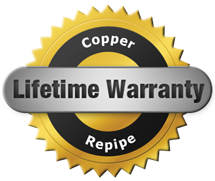 Contact the qualified copper repipe team at 408-465-0025 to obtain a fast quote. When you are in need of a Salinas repipe services, contact the go-to team at Gladiator Repipe. We can replace worn out, leaking steel and plastic pipes. We offer excellent customer service, and always come highly recommended. Consider asking our company to complete your repipe project soon. Over years of use and abuse old water pipes begin having issues, and tend to start leaking. Leaking pipes will then create high water bills. Select us as your repipe specialists in Salinas, California! Ask Gladiator Repipe to replace your home’s old water pipes with brand new copper pipes. You’ll enjoy clear, good tasting water in your home for years to come. Do rusting old steel pipes give your tap water an unpleasant taste or odor? Ask us to tear out old steel pipes. We also offer copper pipe replacement in Salinas. Simply call 408-465-0025 now to receive an estimate. We’ll replace old pipes with new pipes that will help our customers enjoy attractive tap water. Call Our Salinas Copper Repipe Plumbers Today! When you are in need of copper repipe services in Salinas, contact the Gladiator team today at 408-465-0025. Ask for an estimate or schedule an appointment today.